Seven Oaks Hospital’s emergency department is set to become an urgent care centre in the fall of 2019. In the meantime, nurses there are concerned about a staffing shortage. 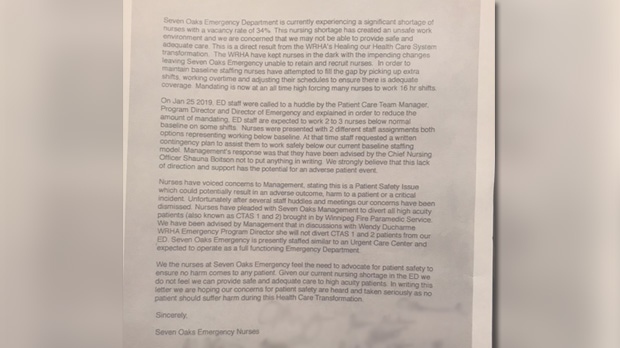 In a letter sent to government officials, obtained by CTV News, the nurses expressed their concerns about patient safety. “We may not be able to provide safe and adequate care” the letter read, it also mentions a vacancy rate of 34 per cent. Manitoba Nurses Union president Darlene Jackson said that equates to the department being four to six nurses short in a 24 hour period. “There is just not enough nurses to provide that quality of care that nurses want to provide and that patients deserve” said Jackson. “It’s very disheartening, but its disrespectful to those nurses” she added. Jackson said the issue was brought up with the Winnipeg Regional Health Authority but felt it was dismissed. WRHA chief operations officer Lori Lamont said hospital leadership is working on a solution with the staff. “Recruiting brand new staff can be challenging when we know a change is coming” she said. Lamont said at the end of January the vacancy rate at Seven Oaks Hospital’s emergency department was around 20 per cent and there’s also been a reduction in patient volume. Manitoba NDP Leader Wab Kinew advocates for more staff and says these shortages are a direct result of recent cuts. “There needs to be more nurses, there needs to be more people working here at the ER and bigger picture the government should cancel their plan to close the emergency room here at Seven Oaks,” he said. The nurses are requesting the most critical patients be taken elsewhere, but Lamont said that would be putting undue stress on other emergency rooms. The province confirmed it received the nurses’ letter Monday afternoon.